This is a great formula for lengthening and thickening your eyelashes. It's got a gummy consistency that can be annoying, but it wears well. This mascara looks great, and lasts at least 8 hours. It gives both length and volume, I find it is very easy to use, too, with a great wand. Also it is not too expensive. I love this mascara! 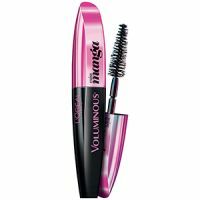 I've always loved the Voluminous mascara. I decided to give this one a try. The wand seems a little weird at first, and I'm not sure if the fact that it is tapered to reach all of your lashes actually works. I still have to wiggle the brush to get all of my hairs. It is flexible, but I'm not sure if that helps at all. However it does a great job of making my lashes stand...read more out. It only ever seems to run if I get really really sweaty, which concerns me since I bought the waterproof mascara for that reason. However it doesn't flake off and leave my eyes looking like a raccoon like many other cheap mascaras do.